2018 - This year, the National War College (NWC) awarded the first Theodore Roosevelt Award sponsored by the TRA. 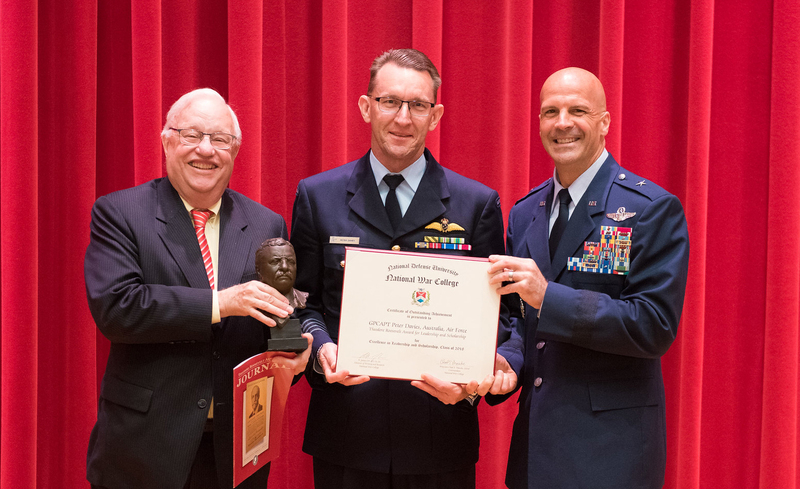 You can be proud of the first awardee, Group Captain Peter Davies of the Royal Australian Air Force, who was extremely popular with both his fellow students and faculty and the unanimous, immediate choice of the Administration. NWC, located in Roosevelt Hall at Fort McNair in Washington, DC, is the highest level of education offered by the National Defense University. Its graduates are fast tracked to become Admirals and Generals. Officers attending this one-year program are drawn from all branches of the U.S. Military and from the State Department and intelligence communities. Each year a few foreign officers attend as well. Group Captain Davies wrote: "I still reflect on the National War College award day and find it amazing (and humbling) that I achieved such significant recognition for my efforts. I donated $250 towards establishing an honor board to record the recipients of the Theodore Roosevelt Award and hope to inspire both the Americans and the International Fellows to support this undertaking." Taking up the Group Captain Davies' challenge, the TRA has established a fund for this effort. Donations will be greatly appreciated. Please mail checks made payable to the Theodore Roosevelt Association with a notation for the NWC/TR Award toTRA.